Our Scuba Diving Resort Course in Key West, Florida, offers people who are not scuba certified to experience the astounding underwater environment of the region without spending the extensive time and expense of completing full scuba diving certification. On this dive-in-a-day program, you can learn to scuba dive from our PADI-certified dive instructors and head offshore into the open water on the very same day. This tour is especially convenient for visitors who are only in Key West for a weekend or a few days. The breathtaking sights below the crystal-clear surface off Key West need to be seen in person to be believed. With the only living coral reef on the Atlantic coast of North America, Key West offers scuba divers a truly one of a kind experience diving that cannot be found anywhere else in the continental United States. Just because you've never tried scuba before does not mean you cannot discover the teeming marine environment of the Florida Keys. Our Key West Resort Course package allows total novices to enjoy this popular aquatic sport. The marine environment off Key West is so wondrous that we want to share this incredible attraction with all of our visitors; we created this specially-designed program specifically for beginning divers visiting Key West for the first time. After you witness the thriving underwater diversity off Key West, you'll be counting the days for your return to this island paradise. On this program, you'll only have to spend a morning in class and confined dive session before you can depart into the open seas to explore a shallow reef under the keen observation of one of our professional PADI-endorsed dive-masters. After introducing you to the theory of this sport in class, you'll become accustomed to breathing and moving underwater during the confined dive. By the afternoon, you will be ready to experience the undersea world off Key West, Florida. 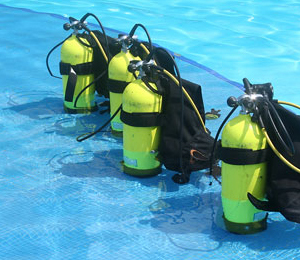 I have been to the Bahamas many times, but Resort Course Dive is one of my favorite trips! It includes everything that everyone should do here. As a Bahamas veteran, I can say only the best about this experience!